So here's the uncomplicated, obvious, and simple strategy for Christian cultural renewal (the author admits this): Live like a Christian. That's it. A reader may be wondering, "Why wonder my way through an entire book to tell me that?" The reason is that Rod Dreher has an accurate pessimism when it comes to the state of affairs in modern Christianity. Most professing Christians have completely lost any sense of integrating their faith with their life. They passively accept whatever the culture throws at them ethically, technologically, and artistically. To be fair, Dreher fleshes out his strategy a little more. The Benedictine order has something to do with his premise. He thinks we can learn something from the life of a Christian monk. We can. But, we must be very, and I mean, very, careful here. I would never recommend this book to someone unless I was completely assured that their level of discernment was high. Dreher makes some excellent points (mainly in his critique of modernity), but also says some potentially harmful things. Here are some of his better points: Toward the beginning he offers a jet-tour through Western civilization and, much like Richard Weaver, blames nominalism for our current cultural ills. He's right about all this. His section on technology at the end is great. We are addicted. It's sucking our humanity away. Monks definitely don't have the same problems (it helps when you give it up!). Dreher endorses the classical school model. More kudos coming from me. In addition, he suggests a life of prayer and reflection. These are lost disciplines, and yes, they need to be rekindled. There are more things the author says but these are the main take aways in my opinion. Now on to the dangerous stuff: The greatest issue I see is Dreher's endorsement of "mere Christianity." Not the book, but the movement. He sees denominational barriers as a problem. We ought to have fellowship (Catholics, Orthodox, evangelicals, etc.) around the fact that we hold some basic truths and the secular world is persecuting us for them. This is a slippery slope. Scratch that, it's a leap off a cliff. The gospel must be the basis for any kind of fellowship. There is no Christian fellowship outside of it no matter how many common enemies or beliefs we may share. I'd be curious if Dreher invites Mormons into this sphere? He actually gives praise to the Mormon's sense of community while distancing himself from their theology. I don't think Dreher is thinking two steps ahead on where this kind of stuff eventually goes. There is much more than can be said, but everything else is of lesser consequence. This may be a good book for someone interested in navigating technology and education in the modern age. Even then I think there are better books. This book is not revolutionary and eventually even Dreher's strategies are unlikely to work completely. He hints at a principled pluralism. I'm not sure if he'd ever use the term but the bottom line is that a secular government if left unchecked will not allow Christians to carve out these Benedictine "safe spaces." Still, Dreher makes some good points that are worthy of being heard. One of them I was already pondering, but he reinforced, was the need to incorporate liturgy in personal and church life. I think most of his good points Nancy Pearcey made in "Total Truth." 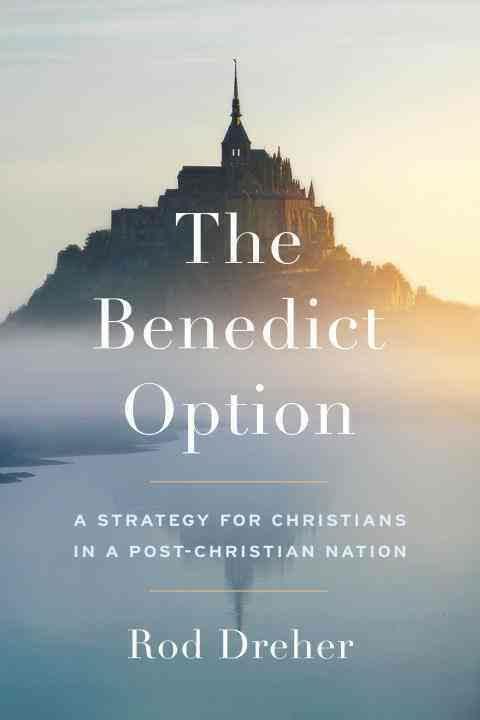 If you read Francis Schaeffer sprinkled in with Neil Postman there's really no reason to read "The Benedict Option."